A new, ambitious award and association for European animation is under way. French producer Olivier Catherin talks to Zippy Frames about the European Animation Awards. It all started during the 2015 Annecy festival, when we received a press release stating the new initiative by Didier Brunner (producer of Kirikou and the Sorceress, The Triplets of Belleville, Ernest & Celestine) Olivier Catherin, Jean-Paul Commin and Denis Walgenwitz to found a new association and award for European animation, deftly called European Animation Awards. According to the statement, the quality and the diversity of the European productions justify the creation of a structure devoted to the organization of an annual ceremony by professionals, and for professionals, celebrating the creativity and energy of a sector which counts multiple and undeniable successes. The idea undeniably seemed interesting, and we asked French producer Olivier Catherin (who produced the César-awarded Mademoiselle Kiki et les Montparnos by Amélie Harrault, and also Betty's blues [Rémi Vandenitte], Snow [Ivana Sebestova]) to elaborate on the idea. ZF: How this idea of European Animation Awards got started? OC: It is modeled on the Annie Awards, which award many categories inside the animation profession. Still, the Annies are only voted by ASIFA-Hollywood's professional membership, many of whom are working in Los Angeles on major studio films. From time to time, there are some European features that get nominated in the Annie Awards, like Ernest & Celestine; and ASIFA-Hollywood has, as of 2015 included a category exclusively to honor Independent Animated Features). And although we do see independent films receiving nominations in the some of the individual achievement categories (Direction, Writing, Editing...), we have established the EAAs to more fully represent and recognize Europe's finest. We have a difficult task, however, in that we need to organize the process to include the participation of 30 different countries. So, we had this idea of establishing a new award exclusively for European animation. We have a more difficult task, for ASIFA-Hollywood members just one country, US; we need to organize the whole process with regard to 30 different countries. ZF: Do you intend to cooperate with local ASIFA chapters in this effort, and how? OC: This is the first problem.We did contact some ASIFA chapters, but ASIFA is not that strong in all European countries. So, Didier Brunner, who has strong connections throughout Europe and I contacted animation festivals and professionals throughout Europe. We'll use the ASIFA network, but we'll go further than that. ZF: Do you plan to have a new association, and what is the timeline of your future actions toward establishing these awards? OC: We intend to host our first awards in December 2017. Yes, we do plan to build a new association, but with a different structure from ASIFA. It will consist of two parts, just like the Academy of Motion Pictures Arts and Sciences, which gives the Oscars. There will be the members of the board, which organize the whole ceremony, as well as voting members, animation professionals in Europe. The whole procedure needs to be open. You just need to state that you are a professional in animation (a director, animator, producer, distributor, journalist), you then pay the annual fees, and can vote. That's the idea. The most difficult part is to select films. ZF: So, what do you envision will be the selection process? Cartoon D'Or award, for instance, selects its winner among the best films previously awarded in European animation festivals. OC: It would be too complicated to have all animation films made in Europe submitted for an award. For the time being, and regarding shorts and feature animation films, our idea is to use the selected films from major animation festivals, like Annecy, Stuttgart Festival of Animated Film (ITFS), Animafest Zagreb and others. Regarding TV animation series, we can't use the same procedure, for TV series are under-represented in festivals. It is very important to have recommendations from national committees, producers or professionals, for it is impossible to watch all European TV series broadcast within a year. We are currently working on that. Our first job is to create "ambassadors" in each country for all facets of animation films. Our next task is to see exactly how many categories are being awarded. ZF: Do you plan to follow the category system of the Annie Awards? OC: We won't copy the Annies, but we are inspired from and hope to build on the great work ASIFA-Hollywood has done to honor the best in animation - which, we believe, includes European films and artists. We'll keep some categories, but we will create other ones as well. We are thinking of establishing 15-20 categories, but no more than that. We don't want a very long ceremony [he laughs]. It is not possible to award all professions in animation, so we'll have to launch our first ceremony, and then we'll go on from there. ZF: Where do you plan to host your first ceremony? OC: Difficult question. We don't know yet. There are two options: the first is to host each year the European Animation Awards in the same city, for it is very difficult in terms of organization to change cities every year. For instance, Paris would be an option or any other city that would like to undertake the event. The second option is for the EAA awards to be given in conjunction with animation festivals, so the organizational cost is minimized, and we move each year from one animation festival to another. We'll have to discuss that. But our next step is to get more people involved in the new association. ZF: A last question: why European Animation Pride Awards? OC: This was Didier Brunner's idea! [he laughs] We need to be proud of our European animation. Of course, pride is widely now (respectfully so) associated with gay rights. The name might eventually change, but at the time you could say that this matches our intention to show that we are very open in our membership and selection. [Editor's Note: The "Pride" name was finally dropped out by the EAA Board in its 2016 Annecy convention, in order not to create confusion with the LGBT movement]. 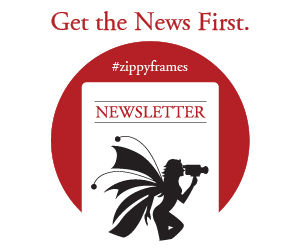 ZF: Olivier Catherin, thank you very much for talking to Zippy Frames. A call for both members and ambassadors (national contacts for EAA) is now advertised at the offiical EAA site, while the first round of national contacts has already been selected.